Choose new textures for each type of dragon in (vanilla) Skyrim. Nineteen total textures (13 by me, 6 defaults modified), user-friendly installation with NMM and image previews so you know what to expect in-game. If you downloaded Bellyaches New Dragon Species in the past, you'll remember that I made some dragon textures for new dragons that I added to the game. If you also downloaded Bellyaches HD Dragon Replacer Pack in the past (uploaded by l2edShift), you'll remember that I modified the existing dragon textures and cleaned them up, added higher quality eyes, fixed seams, that sort of stuff. This mod takes all of my dragon textures from New Dragon Species and the HD Dragon Replacer Pack (vanilla only, no expansion dragons included here yet), mashes them together, and makes them easy to choose from in Nexus Mod Manager (NMM). What does this mod do exactly? 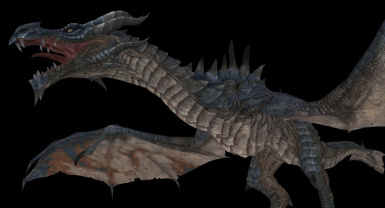 Do you want the frost dragon to have the skin of an elder dragon or Odahviing to look like a Brilliant Leviathan? Well, you could have renamed files and done all that stuff manually before, but now you can do it with a few mouse clicks in NMM, and you get a preview of what your dragon will look like. This mod does not have textures for any of the expansion dragons (revered, legendary, and serpentine). Perhaps in a future update I can add them in. Please check out the attached images for a preview of all the textures offered by this mod. How is this different from your HD Dragon Replacer mod? The HD Dragon Replacer mod has no options, i.e. the default dragon texture is replaced with a modified dragon texture that is true to the original. The HD Dragon Replacer includes modified textures for vanilla dragons, expansion dragons, and Alduin. 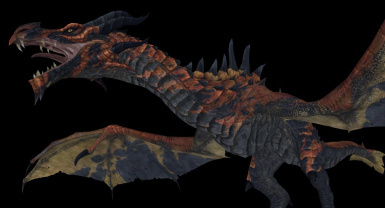 This mod only includes the modified textures for the vanilla dragons. 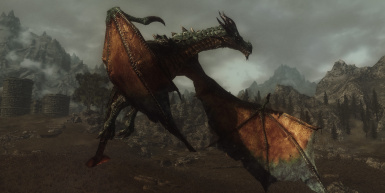 No legendary, revered, serpentine, or Alduin in this mod. How is this different from your New Dragon Species mod? New Dragon Species added new dragons to the game and didn't affect the default dragons. This mod just adds the new textures so you can use them in place of the defaults. What do I need for this mod? 1. You need vanilla Skyrim. No expansions required. 2. You also need Nexus Mod Manager. It would be too tedious for me to explain how to install a particular choice of textures for everyone who asks. The choice is simple, because I only give you two choices. 1. 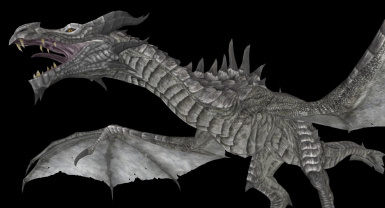 Anything that modifies dragon textures. Load this mod last if you want these textures. its texture from dragon.dds. You use this mod to change dragon.dds, and now your named mod dragon looks different, too. 3. Using too many high resolution texture mods can crash your game. Know your limits, grab the low resolution version if you are concerned. I'm going to come right out and say that my LOD textures are pretty bad. You know those textures that appear on dragons when they are way out in the distance, and the dragon mesh is, like, 20 polygons? Yes, those. I didn't have my tablet handy, so some of them got colored in with a mouse. They look pretty sorry anyway when done correctly, so I didn't put too much effort into them. I suggest No Dragon LODs. You will thank me later, because you do not want to see my LODs if you can help it. I give you my textures as is. I know they are not perfect, and sometimes where the horns meet the head there is an area I should have colored in better. I do not have my original Photoshop files anymore, so please accept these as they are. Even though this mod cannibalizes previous work that I have done, it still took me a great while to get everything together in working order, write the NMM script, troubleshoot the installer, and take screenshots for your pleasure. Screenshots were taken with the high resolution version of this mod and Stakado Cinemascope ENB, a performance ENB. Your results will vary depending on what you use (or don't use). 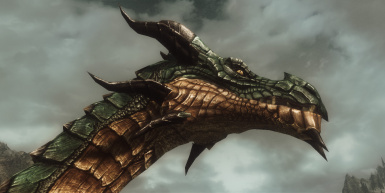 All textures utilized Bethesda's high resolution dragon texture as a base. As with all of my textures, you are welcome to use them in your own mods without my explicit permission, I only ask for a little credit somewhere on your mod.